NYC, 11/09/2018, 7:00PM. 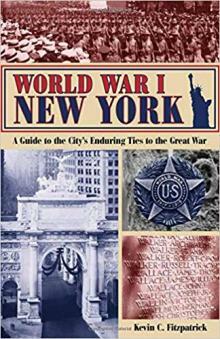 World War I New York: A Guide to the City’s Enduring Ties to the Great War. American involvement in World War I started and ended in New York Harbor. In 1917, many troops departed from the city which would be an important hub throughout the war as recruiting and patriotic efforts continued. Following the Armistice in 1918, more memorials were erected to World War I veterans than for any other event. Now on the centennial, explore more than 50 locations in New York that have ties to The Great War and tell the stories behind each. With author Kevin C. Fitzpatrick.